I wanted to try out some new knitting stitches and found a diamond-shaped pattern called Grating Stitch that appealed to me. This pattern is worked over a multiple of 8 stitches, and also eight rows, which makes a subtle, but interesting diamond texture. For the dishcloth, I knitted four repetitions of the pattern in each row, but to make a larger washcloth, I’d add at least one more repeat. The border shown on the sample is two garter stitches along each side and four rows of garter stitch at the top and bottom. You can change this to a different border pattern if you like; just add the required stitches to the beginning and ending of each row. I’d rate this pattern as easy and suitable for a beginning knitter who is ready to do more than stocking or garter stitches. The gauge is not critical, however, it’s not a mindless piece of a knitting, as you must keep track of the pattern rows. With something small, like a dishcloth, you are changing rows so quickly that losing your place is easily done. which is, I think, out of print. If you’re interested in trying out new stitches look for a used copy at your local thrift store or yard sale; it’s a good investment. Amazon also sells used copies of the various editions of this book from private sellers. Pattern is worked in multiples of 8. 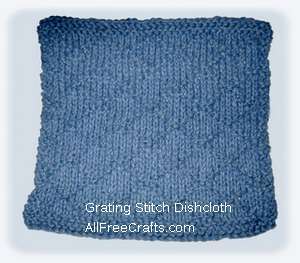 For a dishcloth that is approximately 7½ inches square, use four repetitions of the pattern in each row. For a larger washcloth, add at least one more repetition (and cast on another 8 stitches). Cast on 32 stitches for pattern (four repetions) plus four stitches for a two-stitch border at the beginning and end of each row. Total 36 stitches. As you proceed, work two garter stitches at the beginning and end of each grating pattern row (or knit your own border design). Repeat these 8 pattern rows to make the dishcloth or washcloth to the length that you want. Remember that another half inch or so will be added by the last border rows. Knit four rows in garter stitch to complete the border. Cast off. Cut yarn and weave in ends. The photos don’t show the detail as much as I would like, but this is an nicely textured dishcloth, with just the right sort of “give” or “stretch” that makes a knitted cloth work well when folded over to wipe dishes (or faces). It would definitely make a nice hostess gift or Christmas gift. The back shows an indented diamond pattern as shown in the closeup Grating Stitch – Reverse photo, above right.